Tottori Kenichi is a foul-mouthed but gifted veterinarian nicknamed Dolittle. His catch phrase is 'pet care means business'. He is the director of his animal clinic and rescues not only 'voiceless' pets but also helps their owners, who lack understanding and caution, with their problems and worries. Working with him is animal nurse Tajima Asuka. Hanabishi Masaru is Dolittle's friend, a charismatic vet and host of a popular TV animal show who is good at making diagnosis but has a secret as he could not overcome his phobia of operating on animals. 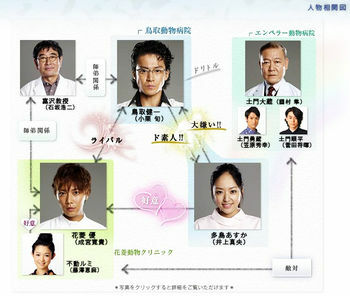 The drama focuses on the friendship between those 3 and tries to teach viewers about human-pet relationships. This page was last edited on 21 April 2015, at 06:36.